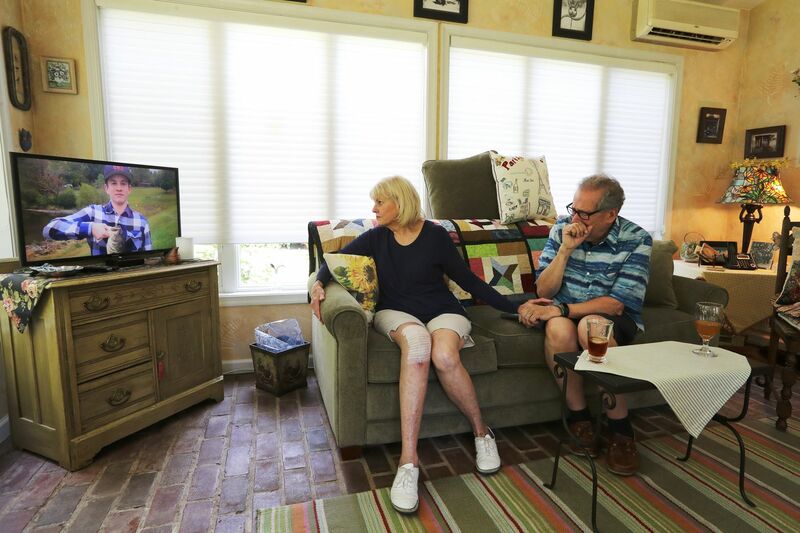 Grandparents Sharon and Rich Patrick, legal guardians of Jimi Patrick watch a memorial video nearing the anniversary of the murders of four young men in Bucks County July of 2017. After Jimi Patrick died, Sharon Patrick sat around the kitchen table, eating pizza with his friends. She asked each of them to share something special about her grandson, something they will always remember. One friend said, "Whenever I would talk to Jimi, he would make me feel like I was the most important person in the room, like there was nobody else around," his grandmother recalled. "Whatever I'd have to say, no matter how trivial it was, it was important to Jimi." Another, Sharon Patrick remembered with a laugh, said: "If there was going to be a party and Jimi Patrick was invited, you knew you were going to have a good time." In the beginning, the grandparents, who had raised three children of their own, thought they might put the baby up for adoption. Then, on July 9, 1998, Sharon Patrick asked her husband whether they should adopt him themselves. "How could we give him up now?" her husband asked her that day. A well-behaved child with a mop of blond hair, the boy quickly stole their hearts. To this day, Sharon Patrick calls him "her soulmate." The two loved to joke around with each other, having snowball fights and spraying each other with Silly String and pranking each other on April Fools' Day. Patrick loved baseball, chicken parmesan with spaghetti, and making other people laugh. In college, friend Juliana May said she remembered one night when he decided to disassemble a friend's bed and move it into the kitchen of his apartment. The prank had everybody cracking up. As a student at Holy Ghost Preparatory School, he went on mission trips to the Dominican Republic and West Virginia. In a journal senior year, Patrick wrote that he wanted to get married and have a family someday, but his main goal was to make a difference in the lives of the underprivileged. In class, he was asked to write about his idols. He wrote about his grandparents. Sharon and Rich Patrick, guardians of Jimi Patrick, recall happy memories of their grandson in his Newtown bedroom as the anniversary of his murder approaches.